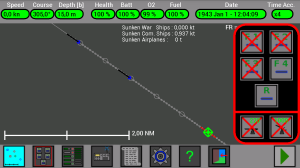 In this example I will launch some torpedoes against a Light Merchant, on its side. 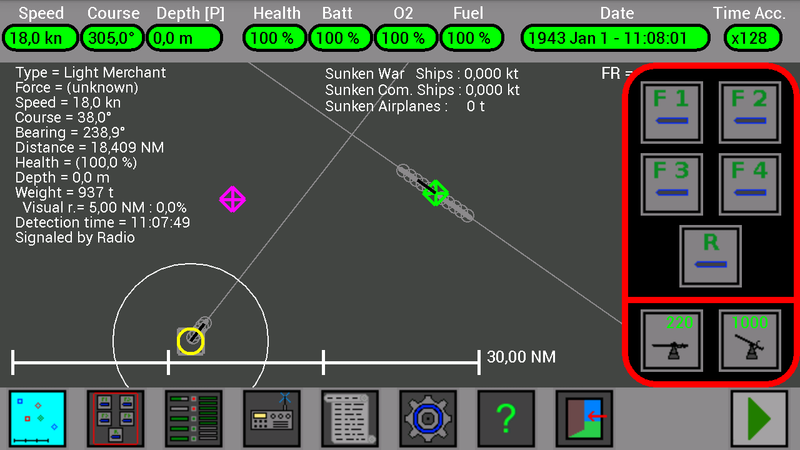 There are 3 units in the map : your U-Boat (green), the Torpedoes Transport (violet) and a Light Merchant (gray). I press on the merchant unit to select it and see its information. 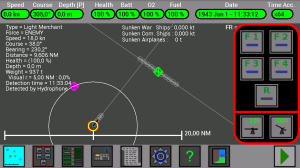 I don’t know if the Merchant is allied, enemy or neutral (it is too far and I don’t see it), I know that it is here because it was Signaled by Radio by the Torpedoes Transport. 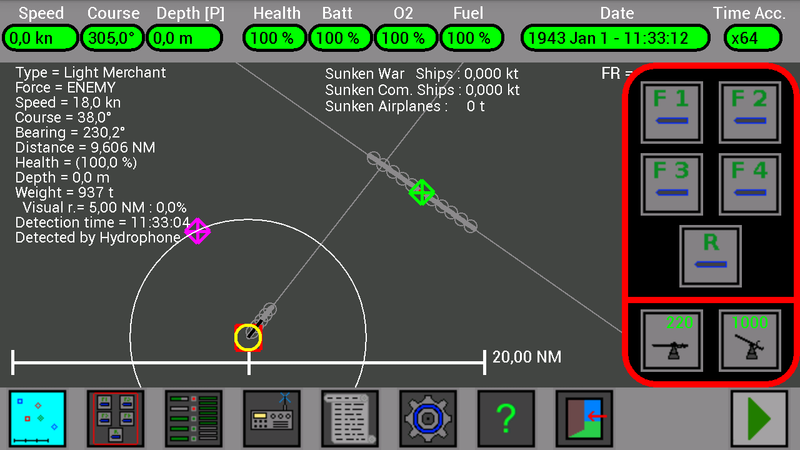 I will put my U-Boat in the right position and orientation, and if the merchant will be enemy I will attack it ! I press the Torpedoes Launch button on the Lower Bar, to show the Torpedoes Launch window and to show the lines that will help me with the attack. 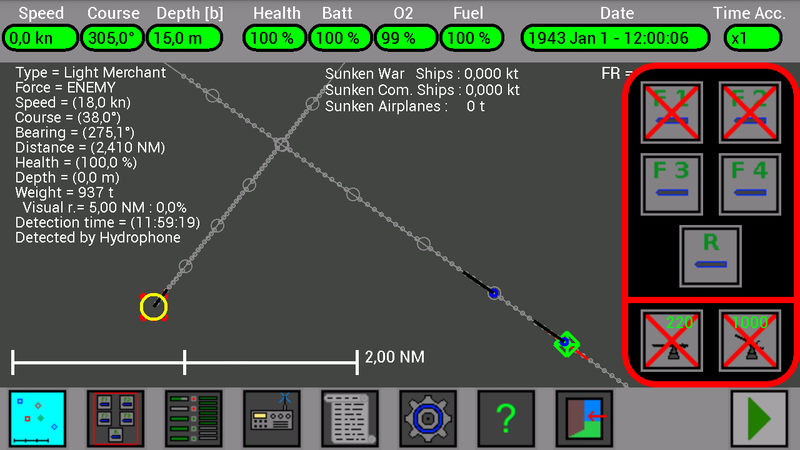 I see that the Light Merchant and my U-Boat are both going at North-East, I will need to go near the merchant and to change my route. I changed the course of my U-Boat (305°) and I’m going at max speed (18kn). I am moving, the Merchant line is near. I will use the 4° circle of my line, I will decrease my speed and I will stop my motors when the 4° circle of my line will coincide with the line of the merchant. I am in the right position, the 4° circle of my line coincide with the Merchant line, my speed is zero (0kn). Now the Merchant is inside my visual range and I see that it is ENEMY. I zoom in the map to check better, it is ok.
Now I am at surface and the Merchant can not see me, because its distance is 9.6 NM and its visual range is 5 NM. But soon it will see me and will try to escape, so I must go at periscope depth and lower my periscope, to remain invisible ! 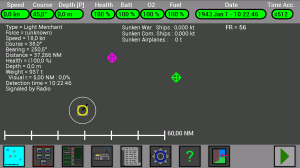 I am inside its visual range but it can not see me, infact if I look at the Information panel, I read “Visual r. = 5.0 NM : 0.0%“. The 0.0% means that the Merchant has no chance to see me ! 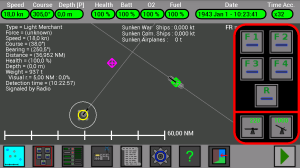 Now I will launch the torpedoes. I have decided to use the 4° circle of my line, so I will launch the torpedo when the 4° circle of my line will coincide with the 4° circle of the Merchant line. 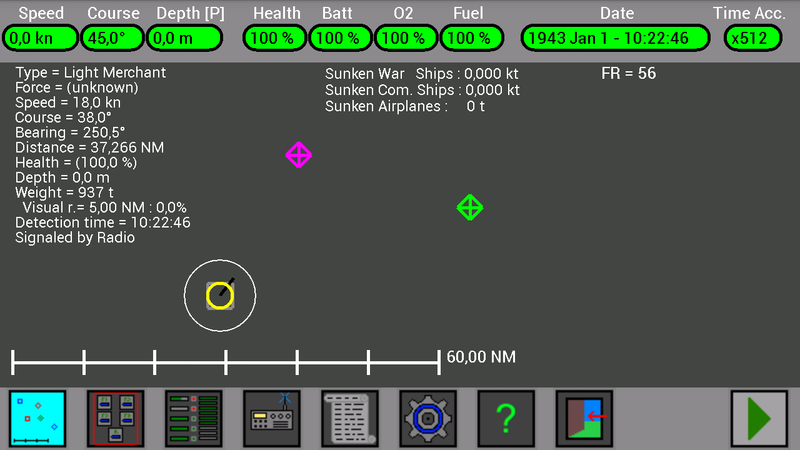 The 5° circle of the Merchant coincides with my 4° circle, I press the button to launch the torpedo inside the first tube (F1), it will not hit the ship. 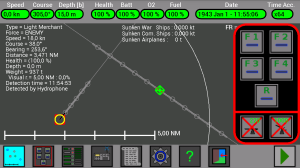 The 4° circle of the Merchant coincides with my 4° circle, I press the button to launch the torpedo inside the second tube (F2), it will hit the ship. The 3° circle of the Merchant coincides with my 4° circle, I press the button to launch the torpedo inside the third tube (F3), it will not hit the ship. The first torpedo is near the Merchant, but the Merchant is still too far. Infact the first torpedo crosses the Merchant line too early ! The second torpedo (launched when my 4° circle coincided with the 4° circle of the Merchant) will hit the ship ! Yes, if I zoom in, I see that this 2° torpedo is really near the ship and will hit it ! 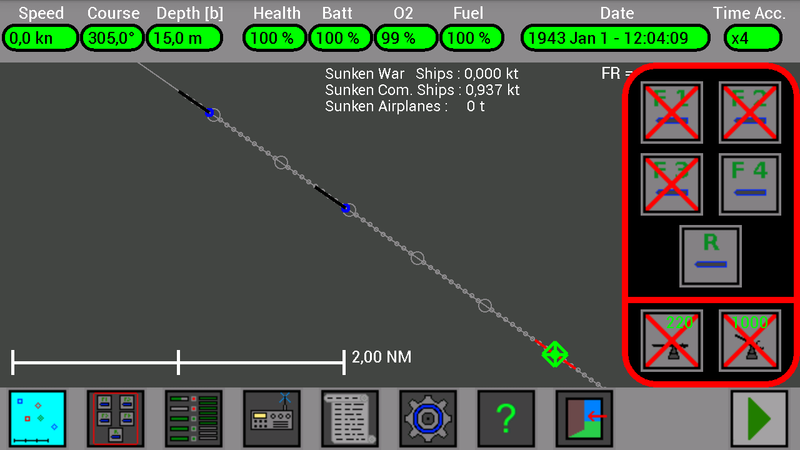 The ship was destroyed by the 2° torpedo, if I zoom out I see the 1° and 3° torpedo still running.